A major contribution to your skin and hair color comes from the melanocortin 1 receptor (MC1R) gene. This gene produces the MC1R proteins that speckle the surface of pigment-producing cells called melanocytes. These proteins play a key role in natural pigmentation, tanning—and protection from the sun’s ultraviolet (UV) rays. When the MC1R receptor is activated, it initiates a series of chemical reactions inside melanocytes that lead to the production of a pigment called eumelanin. Individuals whose cells produce a lot of this pigment tend to have darker skin and hair, in addition to UV protection. Individuals with red hair and fair skin carry natural variants of the MCR1 gene, denoted MC1R-RHC. These variants produce a different skin pigment, pheomelanin, which doesn’t allow skin to tan very well—and also doesn’t protect it from the DNA damage caused by UV light exposure. The Boston researchers looked more deeply into this biological pathway. After exposure to UV light, the hormone α-MSH is produced and binds to MC1R. Normally this complex then binds to a well-known tumor suppressor protein called PTEN. But people who carry the MC1R-RHC variants produce a mutant MCR1 protein that can’t bind to PTEN. Without this protective mechanism, PTEN is degraded, thus removing the brakes from a cancer-causing pathway and encouraging cells to grow and divide more quickly than they would naturally. If this kind of degradation of PTEN in a melanocyte was sufficient to cause cancer, this would be a truly horrendous situation for redheads. But the researchers found something paradoxical: having an MC1R-RHC variant that reduces PTEN actually causes melanocytes to transition into a state of old age (known as “premature senescence”), in which they can’t replicate. But—and here’s the critical point—if one of these mutant pigment cells also acquires a mutation in the BRAF gene, these cells exit old age and become cancerous. Mutations in BRAF, not inherited but acquired by errors in copying DNA in specific cells (so called “somatic mutations”), are a major driver of melanoma—70% of melanomas in people of all different skin colors carry these somatic BRAF mutations. 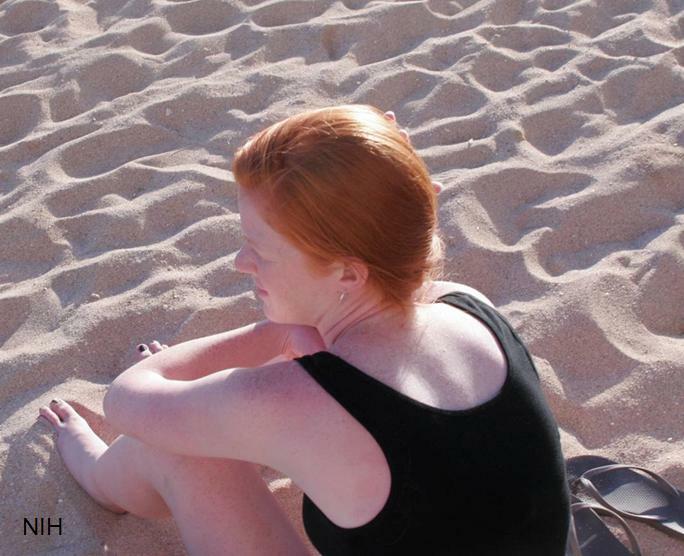 For redheads, the heightened risk of melanoma thus comes from a triple whammy: 1) an inherited form of MC1R, MC1R-RHC, that is less able to produce UV-protective eumelanin; 2) UV-triggered degradation of the PTEN tumor suppressor because of variant MC1R-RHC; 3) a rare somatic mutation in BRAF, potentially also triggered by sun exposure. Together, they set the mutated cell on a pathway toward melanoma. This research provides one more piece to the melanoma puzzle, and suggests some new approaches to treatment. But the best treatment for this very dangerous cancer is prevention. So wear your sunscreen, especially if you are a redhead! MC1R Is a Potent Regulator of PTEN after UV Exposure in Melanocytes. Cao J, Wan L, Hacker E, Dai X, Lenna S, Jimenez-Cervantes C, Wang Y, Leslie NR, Xu GX, Widlund HR, Ryu B, Alani RM, Dutton-Regester K, Goding CR, Hayward NK, Wei W, Cui R. Mol Cell. 2013 Aug 22;51(4):409-22. I really like looking through a post that makes people think. Also, thanks for allowing for me to comment!